Last week, I joined non-governmental organization (NGO), community, and health care leaders at a ceremony held to honor those whom we have lost to AIDS in Tajikistan and throughout the world. This year in Dushanbe, the International AIDS Memorial Day ceremony was conducted for the second time at a public City Health Center, rather than at an NGO or AIDS Center, marking a growing acceptance by front-line health care workers of the key populations at higher risk who come to their facility for services. The ceremony was a time to mark the many steps Tajikistan has made in the fight against AIDS, but it was also a time to remember the suffering and loss experienced by many and to call on the community for greater acceptance and support of those in need. 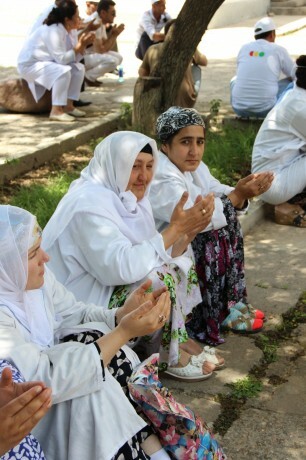 Since 1991, over 800 people in Tajikistan have died due to AIDS-related illnesses. As pointed out by Sevar Rahimovna Kamilova, a brave woman who leads an HIV-focused NGO here in Tajikistan, “Those lost to AIDS come from all genders, ages, religions, social strata, and professions.” Ms. Kamilova also shared that in Tajikistan now, almost 5,000 people are officially registered as HIV-positive. Of these, less than a third receive anti-retroviral therapy. Pulod Jamolov, director of a local NGO that supports people who inject drugs, movingly described why so few HIV-positive individuals are tested and receive treatment. “Discrimination and stigma directed at HIV-positive people result in a reluctance to do anything that would make their status known – including discussing risks with health care workers when they have medical needs, seeking out an AIDS Center to get tested, or receiving the free treatment offered by the government through support from the Global Fund to Fight AIDS, Tuberculosis, and Malaria.” This fear, combined with ignorance of available options, means that many people will die who don’t have to. Yesterday’s ceremony brought home to me yet again the importance of the work that USAID, PEPFAR, and its partners are doing to reduce stigma and discrimination in Central Asia and to support key populations to access testing and treatment. As the event came to a close, the crowd kneeled as they were led in prayer by a local imam. I looked out at the many white-clad medical workers in the crowd – each braving the noonday heat to honor a group of people that, perhaps just years ago, they would have disdained. International AIDS Memorial Day is indeed a sad day, but it is also a day of hope, courage, and possibility.